So I’m playing a little bit of catch up for the month of November and just couldn’t help but knock out two Upper East Side Starbucks in the same day. After all, they are only three blocks away from each other and on the same avenue. All I had to do was walk three streets down on Lexington from the Starbucks on 87th street to the one on 85th. Although these stores are so close, this Starbucks is technically outside the border of the Carnegie Hills sub-neighborhood that its sister store belongs to. What separates them is a train station and the crowded shopping area on 86th street. The 85th street Starbucks is about half the size of its counterpart with a third of the crowd. It’s L-shaped with the barista bar near the entrance and some extra seating and the restroom located on the north side. 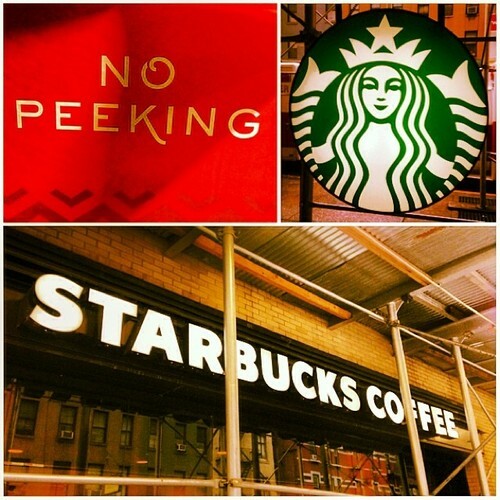 I also spotted a large stack of Starbucks boxes with red stickers labeled “NO PEEKING.” This is probably the third time I’ve noticed these boxes at various locations across the city, and now I’m a little curious as to what exactly they are. My best guess is they are extra inventory during the holiday season, and the labels are just a clever way to keep them in the stores without them becoming an eye sore. Pure speculation, though. It seems like every time I think I’ve got all the neighborhoods in Manhattan pegged, I discover a new neighborhood or sub-neighborhood. 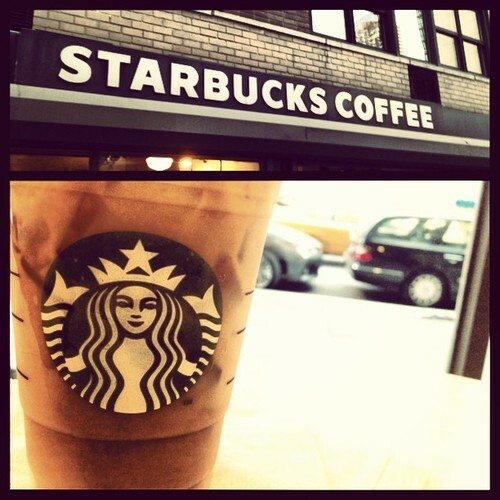 Today, I’m sitting at the Starbucks on 87th & Lexington in the Upper East Side. This particular area is in the southern portion of a smaller neighborhood named Carnegie Hill — which is ironically no where near Carnegie Hall. The neighborhood runs from 86th street up through 96th and was named after a mansion that was built on 91st street which has now been converted into a museum owned by the Smithsonian. In fact, within this neighborhood is NYC’s Museum Mile on 5th Avenue. From 81st street through to 105th street exist ten distinct museums to visit including The Met and The Guggenheim. There’s even a museum dedicated to the history of New York City itself. And, although I’ve only visited The Met so far, I feel some of the others calling my name — especially since the temperature continues to drop. 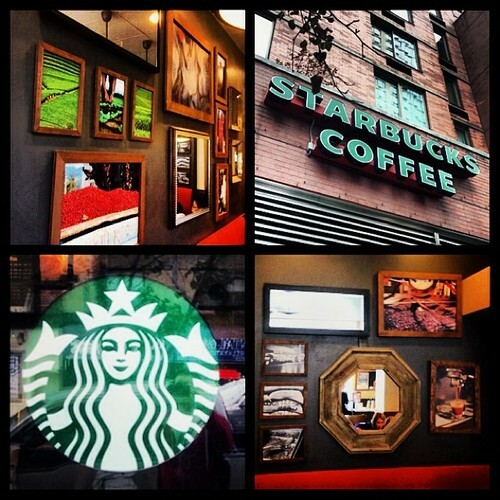 As for the Starbucks itself — it’s fairly impressive. It’s large, contains multiple rooms with tons of seating, and is near some of the best transportation options in the Upper East Side. Something also worth noting is that dozens of adorable dogs passed by on the sidewalk outside during my visit. After all, were just west of Yorkville — home to the baby carriages and dog leashes. No not literally. I’ve just been on a roll with this blog lately. Not only have I visited at least 1 Starbucks every day in October, but this will be my second for the day. Half of the reason for this increase in blogging is due to my awareness of the year’s impending demise. The other half is simply an increase in dedication to the cause. As the year slips away and the amount of undiscovered Starbucks grows smaller and smaller, I’m feeling this heightened curiosity toward each untouched Starbucks. After visiting over 150 locations in New York, have I still not discovered the very best one? Or the very worst one? And maybe there’s a small neighborhood I’ve yet to traipse through that will draw me in the way so many of the others have. And it’s this curiosity that’s making it easier and easier to convince myself to make time to blog each day. Specifically, this Starbucks on 96th & Lexington intrigued me because of its close proximity with the Starbucks I wrote about earlier today. Both are on the border of Harlem and the Upper East Side. However, the Starbucks on 96th & Madison is on the south side (Upper East Side), while this one is on the north side (Harlem). Specifically this one belongs to the neighborhood known as Spanish Harlem — or SpaHa. So I wanted to know if there was a detectible distinction between these two close Starbucks in two very different neighborhoods. The short answer: a little. The Madison Starbucks was small, crowded, and filled with a crowd of tourists and keep-to-yourself patrons. This Starbucks is large, still crowded, and filled with a much more social crowd. A father sits talking with his son. Three teenagers sit at the communal table and angst all over each other. And a couple just walked out after sharing what I’m assuming was a latte — I’m guessing Pumpkin Spice. Other features of this Starbucks include plenty of seating, jazz music and an authentic exposed-brick wall. It’s crowded even late at night, and the crowd doesn’t seem to be waning at all. Also, the locals have clearly pegged this Starbucks as a convenient bathroom stop to and from the 6-train. So in conclusion, although this Starbucks is just on the other side of 96th street, it does indeed have more Harlem characteristics than the Madison location of the Upper East Side. The lines between most Manhattan neighborhoods often blur and lack a clear distinction. You can walk from Kips Bay to Murray Hill to the Upper East Side and not really tell when one neighborhood ends and another begins. Even the Internet has mixed views on the borders of some neighborhoods. Some argue Midtown stops at 34th street; others say it extends down to 14th. And some claim that Alphabet City no longer exists and refer to it as strictly the Lower East Side. However, there is one neighborhood distinction that is almost night and day; below 96th street is the Upper East Side and above is Harlem. 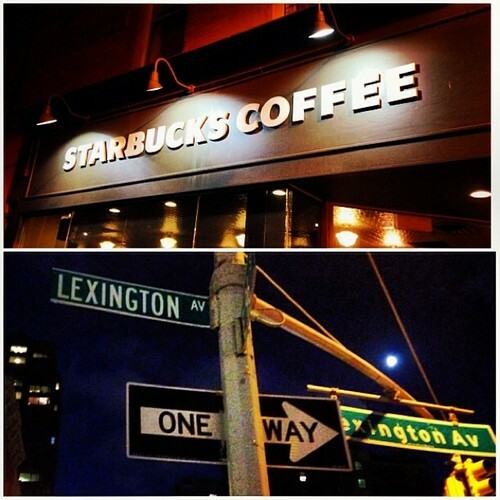 And the Starbucks on the corner of 96th and Madison is right on the border of these two very different neighborhoods. As I walked north across 96th street, I was not expecting the neighborhood shift to be so perceptible. But literally, I knew I was in Harlem without needing to look it up on a map. And no, I’m not talking about differences in race, class, or any of that stereotypical bull. I knew because of the gentrification. Below 96th on Madison Avenue were nothing but independently owned specialty shops, spas, and convenient stores. Once north of 96th, the first three stores I saw were Dunkin Donuts, Subway and Verizon. Case closed. 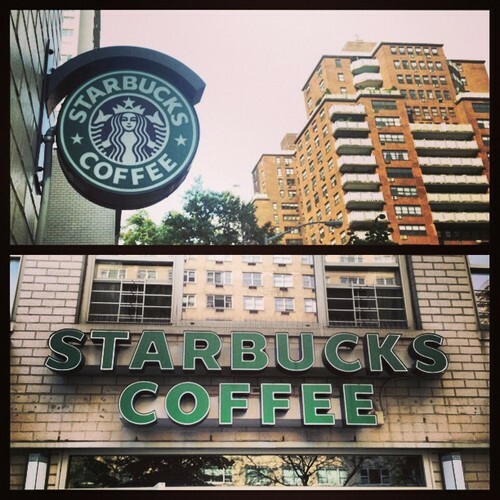 The Starbucks is on the south corner, so it technically belongs to the Upper East Side. But it lacks the size and space of most UES locations, and brings in a more touristy crowd since it is so close to Central Park. The tourists come and go; however, it appears this is also a favored spot for locals to come and hang out for awhile. There’s lots of headsets and laptops taking up the limited seating this Starbucks has to offer… but who am I to judge? Today is one of those typical New York days where the sun skips over the island of Manhattan. Between the tall buildings and hazy skies, the city gets just enough hours of light to justify the passing of a day and then succumbs to darkness once more. And now that summer is officially over, the days are growing even shorter. Still, on a gloomy day like today, going for a walk in the city isn’t a horrible idea. It’s not to hot nor is it cold enough to justify a jacket. 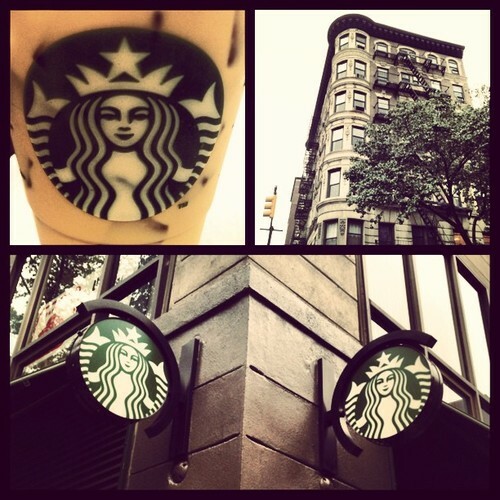 So today, I put on my walking shoes and took a stroll north to the Starbucks on 90th and 1st Avenue. I had this sneaking suspicion that this Starbucks would be the perfect spot for a day of studying, and with the fall semester fully commenced, that’s just what I need. The worst thing you can say about the Starbucks on 90th and 1st is that it’s boring. There’s no chatty line waiting for coffee; no tourists with luggage; and no crazy people trying to give away laptops (see yesterday’s post). There’s just three baristas serving coffee and maintaining a lobby full of studious and quiet patrons. Everyone in here is keeping to themselves, and they are all occupied with newspapers, tablets, laptops or smartphones. Starbucks such as this are certainly a luxury of a small neighborhoods like the Upper East Side’s Yorkville. And if boring is the price you pay for a comfy seat and a place to concentrate, then maybe I’ll rethink my continued boycott of boredom in my life… at least every once in a while. So I doubt this self-made image will ever reach ‘meme status’ but I suspect it will resonate with some. When I walked into this Upper East Side Starbucks, all the seats were taken, which is much more common in Midtown. The crowd was pretty stagnant, so I ordered my drink and was prepared to wait a while. 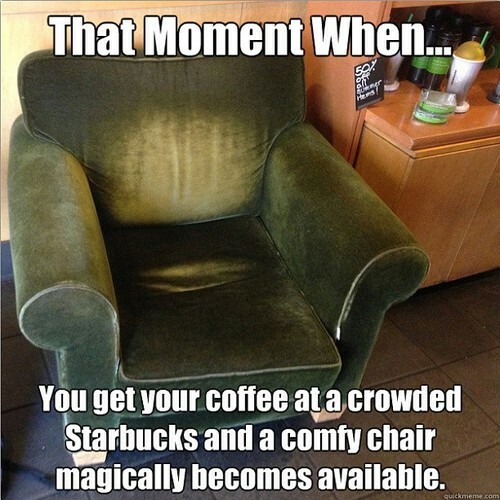 Then — like it was meant to be — a man vacated his comfy green armchair just as I was topping off my iced coffee with breve. 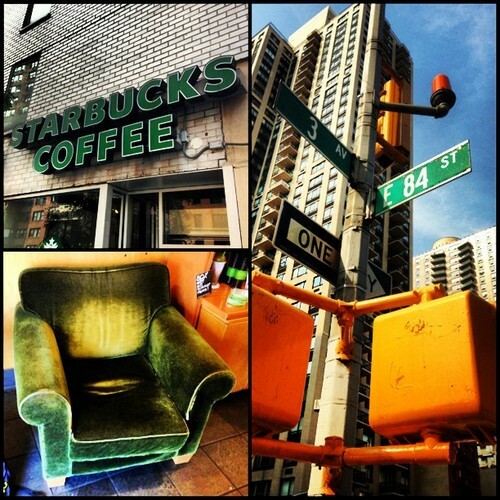 Essentially… NYC Starbucks jackpot! Although this Starbucks is particularly crowded on a weekday afternoon, it is also larger than most Starbucks in the city — which helps disseminate the crowd a bit. It’s close to one of the few 4/5/6 stops on the east side, and on a strip of 3rd Ave that consists mostly of lunch-hour restaurants and other cafes. With comfy chairs as rare as they are in modern-day Starbucks stores, this is a pretty descent location to sit for a while. Just when I thought the Upper West Side had a leg up on the Upper East Side — where Starbucks are concerned, that is — I discover the Starbucks on 81st and 2nd. This Starbucks is in the thick of Yorkville and has more character than any I can remember visiting. The building has obviously gone through some reconstructions throughout the years, and I’m very happy with the end result. The first two floors belong to Starbucks. They’ve expanded the ground floor with a glassed in patio, filled the second floor with seating and kept all the exposed bricks. The sealed in fireplace is still visible, and you can see where the staircase used to climb to the 3rd floor. I’m assuming there are still apartments above this Starbucks — and I’m hoping they’re for rent! 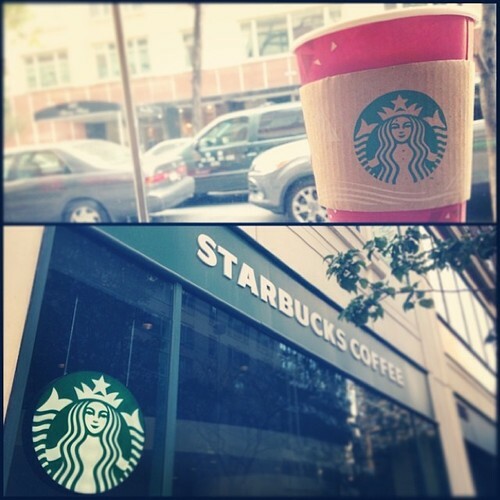 This is definitely a Starbucks that I could spend endless hours in. It would be my “go-to” if it weren’t so far away. All good things must come to an end. Vacations… coffee breaks… Lady Gaga and Perez Hilton’s friendship… and — sadly — this season’s Starbucks Treat Receipt. I almost wonder if it would be more profitable for Starbucks to keep the Treat Receipt program around year-round, but I assume their marketing team has already looked into that and decided against it. It’s kind of like the Disney Vault… if those movies were available all of the time, no one would be buying them. 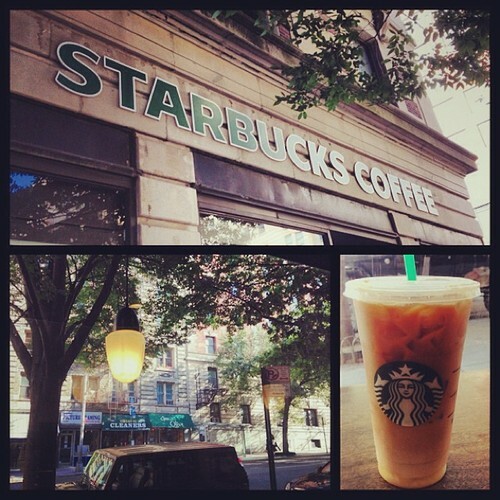 I decided to enjoy my last $2 iced beverage at a Starbucks in the Upper East Side on the corner of 78th and Lexington. To further treat myself, I decided to make it a iced white chocolate mocha, which — if you’ve had one — you know they are to die for. This Starbucks is directly on the corner and extends down Lexington for quite a distance. There are numerous bar stools placed up against the avenue facing windows and an additional seating area with a long sofa, two tables-for-two and a communal table at one end of the store. There are two entrances, one restroom and plenty of uncovered power outlets. The environment is very chill and relaxed — lots of laptops, books and a few families. It’s hard to believe that summer is already coming to an end here in NYC. Labor Day is around the corner and the temp is already starting to drop back into the 60s at night. Looks like my weekends spent laying out in Central Park and walking around in a tank top and shorts will be coming to an end much sooner than I’m used to. However, until I’m absolutely forced to bundle up in snow boots and a bubble jacket, I’ll continue to leisurely explore the city on days like today. Yesterday I spent some time exploring the Upper West Side and after taking a stroll through Central Park, I decided that today I would probe deeper into its counterpart neighborhood: the Upper East Side, specifically Yorkville. It still astonishes me how calm this neighborhood is. I walked a good mile on York Ave before arriving at the Starbucks on 80th street, and mostly I examined couples pushing kids in strollers, people walking dogs, or friends enjoying a bite to eat at some restaurant’s outdoor seating. Even the Starbucks on 80th and York has outdoor seating! This is obviously a thing for Yorkville Starbucks stores. The only other location I’ve visited in Yorkville was on the corner of 85th & 1st, and it surprised me with a private outdoor seating area elevated above the sidewalk. This Starbucks seating is level with the sidewalk, but detached enough to still feel roomy. So roomy, in fact, that most outdoor occupants have a tiny dog at their feet — but then again, that’s just the nature of this neighborhood. And if you can’t find a seat outside — or happen to suffer from cynophobia — there is plenty of room inside. Honestly, this Starbucks has me smitten. I can easy imagine myself coming here to study once classes start up again in the fall. The large couch inside is actually comfy, comfy, not just padded. And with well-placed power outlets and a light crowd, I could see myself spending countless hours here. If it wasn’t so far away from public transportation, this could easily be a a 5-Cup Starbucks. By now, I’ve seen my fair share of Upper East Side Starbucks. And while most tend to be a little larger and cleaner than Starbucks in other neighborhoods, the location on 76th and 2nd avenue failed to live up to my expectations. No it’s not particularly dirty, but perhaps it’s the dim shadow-casting lighting that gives off that impression. All in all, this Starbucks can be described in three words: small, dark and old. 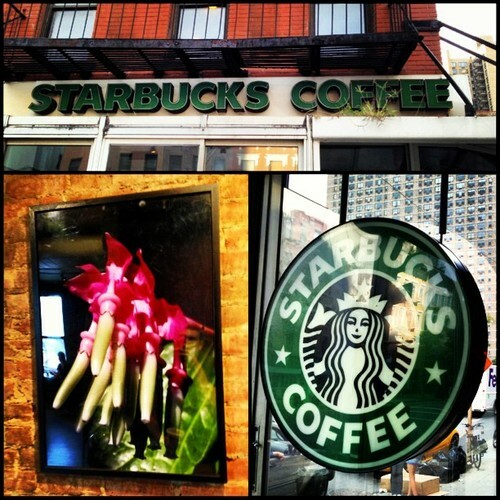 If you pass by on 2nd avenue, you can take in the Starbucks in its entirety in one quick glance. The decor, walls and seating are all stained dark, and the ceiling lights seem to be only turned half on. And something about this location gives me a vintage vibe. Not that intentional vintage look, but I genuinely feel like this location is straight from the 80s. Perhaps it’s the half-paneled walls and plain wooden chairs. The crowd in here is small at this time, but then again, I doubt most Upper East Side residents are feeding their caffeine cravings this late at night. Some come and go, but the crowd inside stays light. However, the Gristedes directly across the street seems to be a happening place. I would say this would be an excellent place to come study or read a book, but you’ll just need to bare with the slightly uncomfortable seating.